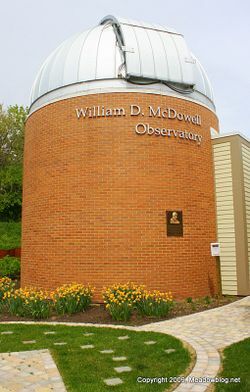 The William D. McDowell Observatory in DeKorte Park has a full schedule for May, including several free public observation nights, a month-long Tuesday-night astronomy course, and a special program on how NASA technology has been applied to everyday life. Observe the skies through the 20-inch diameter telescope of the William D. McDowell Observatory each Monday and Wednesday evening. Because of the later sunsets, the viewing hours will begin at 9 pm. Each free session focuses on two major objects on the night sky, plus one or two other celestial objects or events depending on the observing conditions. Observing is weather dependent and will be canceled for that night if the skies are cloudy at the beginning of the observing session. Click "Continue reading …" to view entire May observatory schedule. May 25: Closed (Memorial Day). Capacity: 25, admission is on a first come, first served basis. Check-in at the NJMC Center for Environmental and Scientific Education. Note: In order to access the observatory telescope, a visitor must be able to climb 25 steps (nine steps, a landing,16 steps) in a spiral formation. The stairs have a railing on either side, with the railings approximately 2 feet apart. Please contact the Meadowlands Environment Center offices at least one week prior to visiting to request disability related accommodations for equal access. The observatory will host four astronomy learning sessions, consisting of classes each Tuesday night from 7 to 9. Every month the focus of the series will change. Sessions are not interdependent, however registration is for the entire month, not per week. Learning sessions will include time spent in the Observatory. May—Galaxies, the Universe & Cosmology: 5th, 12th, 19th & 26th Cost: $20 for the 4 week session. Members Free. Maximum Number of Participants: 15 per class, pre-registration required. The Meadowlands Environment Center is certified as a State of New Jersey Professional Development Provider: PDP ID 324. Each 2 hour class translates to 2 hours of professional development credit. "From Space to Earth: NASA Technology in Your Pocket"
Join NASA/JPL Solar System Ambassador and MEC educator Laura Venner for a look at some of the spin-offs of the Space Program that impact our everyday lives. Had a hip replacement or Lasik surgery? Ever changed a disposable diaper? Donned a flame-proof pair of pajamas? You’ll be surprised at the number of inventions and innovations NASA has given us.